On April 23, 1838, the first steamboat to cross the Atlantic Ocean from England to America arrived in New York City. Come along with Tidbits as we remember the contribution made by steamships. SIRIUS vs. GREAT WESTERN •	The SS Great Western was the first paddlewheel steamship built with the intention of crossing the Atlantic, and it was the largest passenger ship in the world at the time. Built in Bristol, England, it was launched on March 31, 1838, whereupon a fire broke out in the engine room. Damage was minimal, but fifty passengers cancelled their bookings, leaving only seven passengers to make the trip. •	Taking advantage of the delay, rival steamship Sirius embarked for New York, keen on beating the Great Western across the ocean. The Sirius left on April 4, followed by the Great Western on April 8. 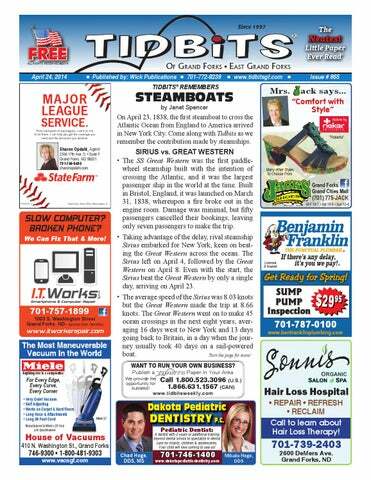 Even with the start, the Sirius beat the Great Western by only a single day, arriving on April 23. •	The average speed of the Sirius was 8.03 knots but the Great Western made the trip at 8.66 knots. The Great Western went on to make 45 ocean crossings in the next eight years, averaging 16 days west to New York and 13 days going back to Britain, in a day when the journey usually took 40 days on a sail-powered boat. Turn the page for more! 5. “Sound Navigation Ranging” is better known as what? 6. “Radio Detecting and Ranging” The prefix “S.S.” before a ship’s is better known as what? name stands for what? 7. What year did George Harrison A California study showed that announce he was quitting The 90% of steamboat boiler exploBeatles? sions occurred when the ships were 8. What was Radar O’Reilly’s engaged in this unwise activity? mom’s name on the TV show “M*A*S*H”? What term is used to describe the 9. What kind of rock is marble? right side of a ship? Why is the left side of a ship TRIVIA called the “port side”? STEAMSHIP BEGINNINGS •	Before steamships crossed the ocean, they plied the rivers. In 1819 the first steamboat made its way up the Missouri River as far as the site where Omaha sits today. It was called the Western Engineer and carried surveyors. It was shaped like a dragon monster, with the steam of the engines emitted from its mouth. It was hoped this fearful sight would prevent Indians from attacking the boat. Apparently the ploy was successful, as the boat encountered no trouble. FULTON'S MONOPOLY •	Robert Fulton is remembered as the father of the steamboat, although John Fitch and John Stevens worked on the invention before him. Fulton adapted ideas of others and put steamboats in the public eye. He applied for a monopoly of steam traffic on the nation’s rivers. The state of New York granted him alone the right to operate steam powered boats within its boundaries. Fulton then asked for similar rights from other states. All turned him down except Louisiana. Controlling steam traffic in Louisiana meant that Fulton ultimately controlled much of the traffic on the Mississippi, because he could prevent all other steamships from reaching New Orleans and the Gulf of Mexico. •	A man named Shreve was also interested in steamboats. To challenge Fulton’s monopoly, he took a boat called the Enterprise down the Mississippi to New Orleans. He put up bail for the boat as soon as he landed, before deputies had even attached it. He then returned north to build a better steamboat, called the Washington. •	On her maiden voyage, the Washington set a speed record for travel from Louisville to New Orleans. The lawsuit against the Enterprise was still unsettled, and the Washington was quickly impounded. Shreve countered by getting a court order holding Fulton responsible for loss of income. SPORTS QUIZ 1. Entering 2014, which majorleague team was the only one to not have a pitcher toss a no-hitter in franchise history? (hint: National League). 2. How many consecutive Grand Slam singles semifinals did tennis star Novak Djokovic make before losing in the Australian Open quarterfinals in 2014? 3. How old was driver A.J. Foyt when he won his last IndyCar race? 4. Of Florida, Florida State and Miami, which was the only college football team to not play in at least one of the first five BCS national championship games? 5. In the 2013-14 season, the Anaheim Ducks became the second team in NHL history to win 18 times in 19 games. Who was the first? 6. When was the last time an NBA Finals team won Game Seven on the road—1978, 1988, 1998 or 2008? FULTON'S MONOPOLY (continued): •	By now, people realized it was a mistake to let only one company run steamboats on the river. Public sentiment was against Fulton. Seeing the writing on the wall, lawsuits were dropped and the monopoly was broken. •	Later Shreve was appointed U.S. Superintendent of Western River Improvements. He invented the ‘snag boat’ which cleared some 300 miles of the Mississippi River of obstacles. Shreveport, Louisiana was named after him. FACT •	One of Shreve’s tasks was to dismantle a floating, living raft made of logs and live trees, weeds and shrubs. This huge tangled mass of vegetation was 26 miles long. Each time the Mississippi River flooded, the raft would be lifted and moved to some other location, blocking shipping lanes where ever it went. It took Shreve five years and $311,000 merely to blast a channel through the center of the raft. It wasn’t until some 30 years later when, with the help of a new invention called nitroglycerin, U.S. Engineers were able to blast away the last of the Great Raft. BUGS IN THE SYSTEM •	Shreve built many steamboats but his favorite was always the Washington. When a boiler exploded on June 9, 1819, Shreve was injured and 8 others died. This was the first in a long string of steamboat accidents. Besides exploding boilers, another problem was the incredible heights of the boats. At first steamboats were only double-deckers, then a third and fourth deck were added. These towering boats could not hold their own against crosswinds and were often blown into shoals. Another danger was the fact that the entire boats were made of wood and were extremely flammable. Answers: 1. Ben Franklin. 2. Isabelle. 3. Macy's. 4. Jennifer Lopez, Keith Urban & Harry Connick, Jr.
1. Whose picture is on the U.S. $100 bill? 2. Who is the American Girl doll of the year for 2014? 3. Who sponsor's the Thanksgiving Day parade every year in New York City? 4. Who are the three judges on this year's "American Idol" contest? BUGS IN THE SYSTEM (continued): •	70% of the steamboats that were destroyed on the Missouri River met their end by striking snags. Nearly 300 ships were lost this way. Shreve’s snag boats removed 2,245 snags and 1,710 overhanging trees in 300 miles. A LANDMARK COURT CASE In 1853 the Rock Island Railroad built a drawbridge over the Mississippi River in order to let trains cross the river. When a steamboat called the Effie Afton smashed against the bridge and sunk with the loss of many lives, the owner hired a young lawyer who argued that the railroad was at fault and should be forced to remove the bridge. Although the steamboat company spent $20,000 on litigation, the case was lost. Soon railroad bridges were popping up along the length of the river. The young lawyer, however, went on to greater things. His name was Abe Lincoln. NUGGET OF KNOWLEDGE The Dutch word "jaght" meant "hunting" and "schip" meant "ship" and "jaghtschip" meant "fast pirate ship." In English, a type of quick maneuverable ship took its name from the Dutch "jaght" and became "yacht." SAMUEL CUNARD •	Samuel Cunard was born in Halifax, Nova Scotia, in 1787, the son of a successful carpenter. He grew up on the shores of the Atlantic Ocean, surrounded by the thriving maritime industries of Halifax. •	At the age of 17, he took over management of his father’s large lumber yard. He then spent three years studying the shipping industry in Boston. When Samuel returned to Halifax from Boston at the age of 21, his father built a wharf and bought a schooner, and together they established the firm of A. Cunard & Son as they engaged in trading up and down the coast of Canada. Soon, a second ship was added in order to engage in river trade. •	When the War of 1812 broke out, A. Cunard & Son was one of the few shipping outfits authorized to operate in American waters while flying a neutral flag. When the war ended, Samuel went to England where be obtained the contract to carry mail from Britain to Bermuda once a month. By 1814, Bermuda enjoyed the most reliable mail delivery of any of the British colonies. In 1816, Samuel Cunard was also granted the contract to carry mail from England to Boston. •	When his father died, the company was renamed S. Cunard & Co as several of Samuel’s brothers joined the firm. By now the company owned thirty ships, all of them powered by sail which was the only option at the time. Next Samuel landed the contract to carry tea for the East India Company of London. Then he bought a coal mine in Nova Scotia and started shipping coal. •	By 1825, the Cunard brothers were becoming interested in a new invention, the steamship. They commissioned the construction of their first steamer, the Royal William. THANK YOU FOR ATTENDING THIS YEAR’S SHRINE CIRCUS! WE HOPE TO SEE YOU AGAIN NEXT YEAR! cal news. The Inverness Courier newspaper related an account of a local couple who claimed to have seen "an enormous animal rolling and plunging on the surface." • On May 1, 1941, months before its release, Orson Welles' landmark film "Citizen Kane" begins generating such controversy that Radio City Music Hall refuses to show it. "Citizen Kane," now revered as one of the greatest movies in history, made its debut at the smaller RKO Palace Theater and was a failure at the box office. • On April 29, 1968, "Hair," the now-famous "tribal love-rock musical" that introduced the era-defining song "Aquarius," premieres on Broadway. "Hair" quickly became not just a smash-hit show, but a genuine cultural phenomenon. • On May 3, 1980, 13-year-old Cari Lightner of Fair Oaks, Calif., is killed by a drunk driver while walking along a quiet road when the car swerves out of control and strikes her. Cari's tragic death compelled her mother, Candy Lightner, to found the organization Mothers Against Drunk Driving (MADD). © 2014 King Features Synd., Inc.
SAMUEL CANARD (continued): •	The Royal William ran between Halifax and Quebec. When a cholera outbreak forced the Royal William into quarantine, the company nearly went bankrupt, but Samuel Cunard was convinced that transatlantic steamship service was feasible. To test his theory, in 1833, he took the Royal William across the Atlantic from Canada to England, making the trip in only 17 days. While in England, he sold the ship. •	Five years later, Samuel Cunard was in England when he saw several side-wheel paddle steamships under construction in the race to be the first steamer to travel across the Atlantic from England to America. He followed the story of the race between the Sirius and the Great Western with interest. •	Back in Canada, he saw an ad in the London Times: “Steam vessels required for conveying Her Majesty’s Mails and Dispatches between England and Halifax, N.S., and also between England, Halifax and New York.” Cunard set sail for England at once, where he won the contract. He commissioned the construction of three steamers, knowing that this venture would make or break him. The new firm was called Cunard’s Company, shortened to simply Cunard’s. By 1940, Samuel Cunard had three steamers making regular ocean crossings in only 12 days. •	After establishing an unbeatable reputation for safety, Cunard began investing in ocean liners, dominating the Atlantic passenger trade with ships such as the RMS Queen Mary, the RMS Queen Elizabeth, and the Queen Elizabeth II. •	Samual Canard died a wealthy man in 1865. The Cunard line continues to this day, although it now operates as a division of the Carnival Corporation and is based out of the United Kingdom rather than Canada. •	In 1851 Prince Albert hosted the Great London Exhibition to showcase technological advances. In conjunction, Queen Victoria invited all nations to participate in the annual 53-mile regatta around the Isle of Wight. Fifteen British vessels entered, plus one American boat. •	The owner of the American boat, John Stevens, was the first commodore of the New York Yacht Club, and his boat was designed by engineer George Steers, who made his living designing sleek, quick boats. It won by a wide margin. Legend has it that when the Queen asked, “Who has won?” and was told who it was, she replied, “And who is second?” only to be told, “Your Majesty, there is no second.” It was some time before the second place winner showed up. •	The trophy and the race were named after Stevens’ boat, and a race was born. What was the name of the ship, now the name of a famous yacht race? Answer at the bottom of the next page. A GOOD LOSER •	As a young man in Glasgow, Scotland, Thomas helped his parents run their small grocery store. He spent a few years living in the U.S. where his work in a New York City grocery store introduced him to the effectiveness of publicity events and advertising. • It was physicist Albert Einstein who made the following sage observation: "Few people are capable of expressing with equanimity opinions which differ from that of their social environment." •	The trophy, made of 134 ounces of silver, was called the ‘One Hundred Guinea Cup’ because that’s how much it cost. It was awarded to Stevens and his crew. He donated the trophy to the New York Yacht Club in 1857 with the stipulation that it be awarded to the winner of international boat races held once every three years, in order to stimulate competition between countries. DIFFERENCES: 1. Railing is missing. 2. Watering can is missing. 3. Pockets are missing. 4. Birdhouse is missing. 5. Shovel is moved. 6 Bush is missing. © 2014 King Features Synd., All rights reserved. over as the symbol of the John Deere brand. 1. “Steam ship” or “screw steamer” 2. Racing 3. Starboard 4. Because that’s the side that always pulled up to the dock in a port. "Steamboats," "Samuel Cunard" and "Nautical Races"